The Set-To-Go Saddle provides the perfect combination of hull conformance and lateral stability. Requires additional pair of saddles. 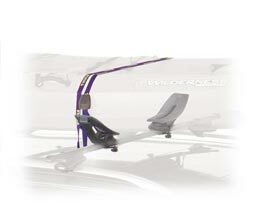 Maximum kayak protection and transport stability provided by soft, adjustable saddle. Fits Thule standard and Xsporter load bars, Yakima®, and most factory installed racks. Includes one ratcheting tie down, strap and buckle protector. Additional tie down required for safe boat transport. Sold as a pair, complete system with additional saddle carrier.